DAVID BOWIE Memory Of A Free Festival (Very rare 1970 7" vinyl single, with intact three prong centre, including Parts 1 & 2 of the song. 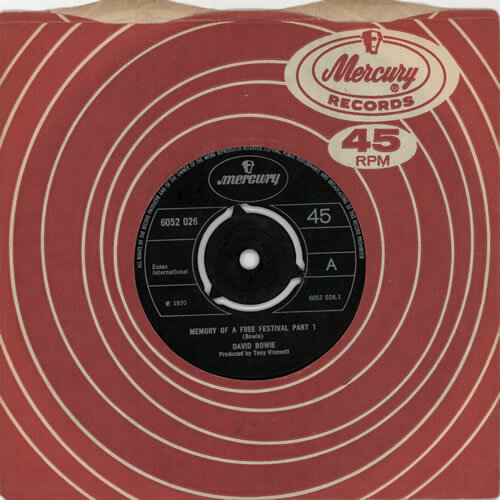 This was originally recorded in 1969 as a seven minute plus single track which was modified a little, re-recorded & split into two parts for this single, Mercury company die cut paper sleeve. The single itself was not a commercial success & stock copies seldom surface, certainly not in as good condition as this one. The vinyl on this copy is nearmint - A superb copy of one of the rarest Bowie single releases).